Stepping into Slash Run, a small bar and burger joint on Upshur Street in Northwest, I immediately began looking for a passage to another room. Stairs, a door, anything- but I didn’t find it. That’s because, even more so than Black Cat or DC9, Slash Run thrives on intimacy. In this bar, standing as far as possible from the band is still going to keep you right in the action. There is no ignoring the music, and any conversation should be conducted outside and around the block. Everyone in the joint is focused and dialed into the music, so it better be good (luckily, two out of three bands that night truly were.) Before the openers took to the unassuming, half-foot tall, carpeted stage, tables were hurriedly cleared and stacked to the side, clearing up a few more precious squares of tile for dancing legs. A stretch of booths ran in a half circle around the stage, enclosing the floor space. Some people sat, but most stood right in front of the stage. The stage itself is so small that the latter two bands of the night barely even made use of it, opting instead to set up their pedalboards and mics on the floor with the groundlings. The close proximity invoked a sense of synchronization between audience and performer. Guitarist solos, audience moves in closer; singer strides around the crowd wildly, audience dances along. I never felt like I was watching a show, I felt like I was a part of it. The first band on the bill was a local act, Capital Offender. The four piece was apparently somewhat of a staple at Slash Run- in a quick conversation I had with the bassist at the bar after the show, he mentioned their proclivity for playing there, often as openers. The lead singer, sporting red hair and an Andrew W.K. shirt, spent her time on stage yelling into the mic somewhat undiscernibly. The energy was there, but the lyricism wasn’t. Unfortunately, Capital Offender felt phoned in, as if they were trying too hard to assure the audience that they enjoyed punk rock. By the time a chorus of “rock and roll infatuation” hit, I was enervated. Luckily, the next act, Starbenders, gave me my vitality back. Sounding a bit like the Clash, their steady rhythm and tight song structure mixed well with the frontwoman’s reverbed-out vocals. The stars of the night were undoubtedly Uni. Fusing glam and classic rock, as well as a touch of indie, Uni sounded old school yet fresh, with boisterous personalities to match. 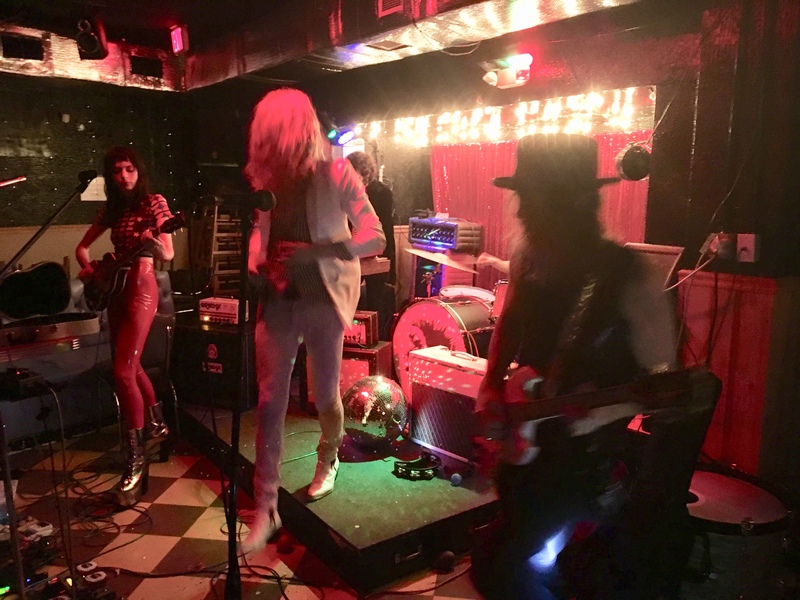 Hailing from New York and composed of Nico Fuzz, David Strange, and Charlotte Kemp Muhl, the trio mixes a host of rock subgenres into their riffs. Whiffs of psychedelia and grunge can be detected, as well as a bit of electronica, especially on their newest single, “Mushroom Cloud.” It’s all wrapped in a light layer of lo-fi, which adds to the ambiguous, timeless feel of the band. Their stage presence is attention grabbing, filled with body gyrations and over the top glam outfits that must have come from an alien thrift store. At one point, Nico Fuzz, outfitted in a blinding white leisure suit, spit flames from his mouth to the raucous applause of the compacted audience. It was tough to even tell how long they played for, I was so mesmerized by the performance. I’m excited to see what the band does next, and from my exchange with Fuzz post-concert, the band has a lot planned. He hinted at a possible tour with the Dandy Warhols, as well as some new singles dropping in March. Keep track of the band at www.uni-bomber.com, and reserve a spot for them on your alternative rock radar.